Both the 2019 Kia Optima and Nissan Maxima are mid-size sedans that lavish you with style and comfort, but that’s where the similarities between them end. Once you take a closer look, it’s actually easy to choose between these four-door sedans. Check out our comparison guide for the relevant info. In addition to its roomy cabin and street-smart infotainment gear, the Optima is known to attract the bargain-hunters among us. That’s because the Optima gives you true family-friendly comfort at a starting price of just $22,990. Typically, cars in the same segment only undercut each other by a few thousand dollars. But the Optima is more affordable than the Maximum by miles. Nissan’s mid-size sedan starts at $33,950 – over $10,000 more than the Optima. Just think of all you can do with that saved cash, from paying down debt to jetting off to sun-drenched beaches. In addition to seriously bolstering your savings account, the Optima’s thriftier powertrain will keep you under budget every month. Depending on how you configure yours, Kia’s mid-size sedan earns up to 27 city and 37 highway miles per gallon. The Nissan Maxima isn’t quite as modern, earning only 20 city and 30 highway mpg. If you’ve got a long commute, you’re actually going to see big savings with the Optima. There’s no need to spend more on a higher trim model, because the Optima comes standard with Kia’s Advanced Driver Assistance Systems. 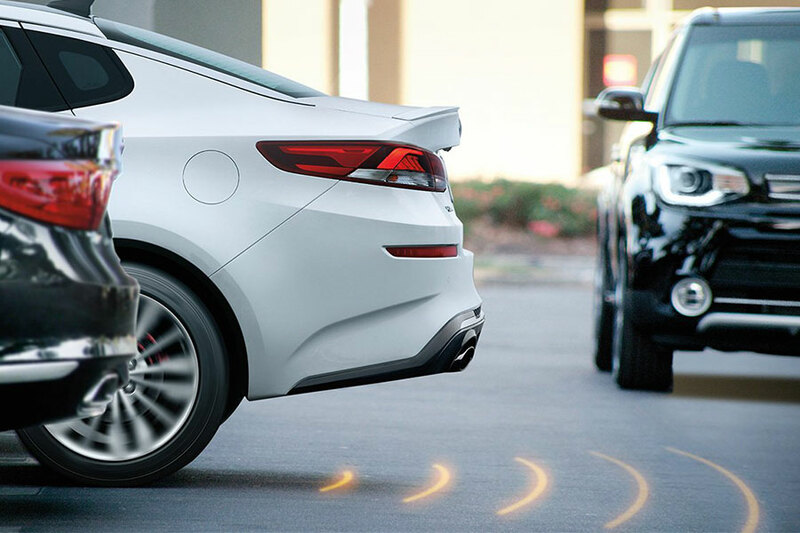 If someone’s headed your way as you switch lanes or back out of a parking space, the Optima will give you a heads up. This sedan also helps you avoid a head-on crash, jumping into action with automatic emergency braking. The latest Maxima is rolling out Nissan’s new Safety Shield 360 package. This bundle includes the aforementioned safety features, making it easier to move through congested highways. However, this precious bundle is only standard on the top-trim Premier. Safety an option for lower trim models, but it forces you to spend extra money on safety. In the battle for comfort, it’s a draw. If you’re only interested in high-quality cabin materials and plush, supportive seating, you’re going to have a really hard time choosing between the 2019 Kia Optima and the Nissan Maxima. The 2019 Optima introduces interior upgrades on almost every trim level. The base model is still as spacious and comfy as ever. Step up to the Optima S for timesavers like push-button start and one-touch power front windows. 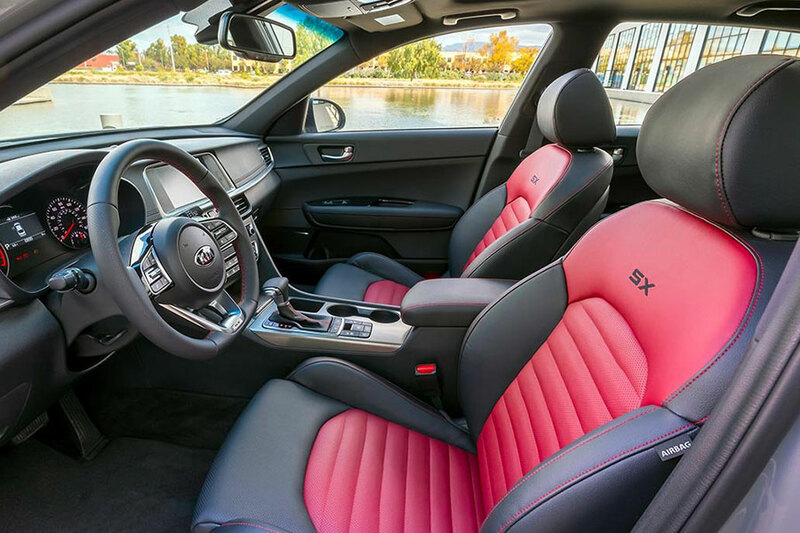 The EX is downright luxurious; new leather seats keep you cozy with seat heaters. The top-of-the-line SX is all about exclusive style with optional leather seats, available in red and black or bronze and black color schemes. Inside the Maxima, the updated cabin is all sharp lines and neatly organized controls. This cabin has never looked better. Upper trims feature classy, diamond-quilted leather upholstery with faux suede accents. At first blush, it might be difficult to tell the difference between the 2019 Kia Optima and Nissan Maxima. By the end of this review, though, we can’t help but swing in favor of the Optima. We think you’ll agree that this Kia’s thrifty base price, standard safety features, and rich interior comfort put the Optima in first place.